A beautiful modern day fable using traditional African story-telling techniques about a young boy in Burkina Faso. 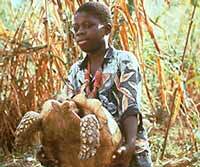 Nine-year-old Rabi acquires a pet tortoise after his father falls off his bicycle swerving to avoid it. The boy's fascination with nature manifests itself in turning his pet on its back and watching it struggle. The boy is heart-broken when the tortoise is taken away from him, but his grandfather helps him find his own tortoise which speaks to him so eloquently about his abuse that the boy eventually sets it free. Seeds of Plenty, Seeds of Sorrow - The darker side of the Green Revolution. "Beautiful modern African parable about our dislocated relationship with the natural world."